In this episode, we go to Xara Dulzura. 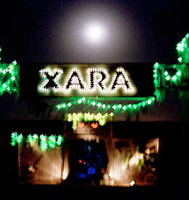 Formerly a theme camp at Burning Man, Xara has grown to become an event of its own. Interviews include: Mark Hinkley, the director and creator of the Xara; Lindsay Lawlor, creator of the Rave-Raffe, an art car that emulates a walking giraffe and finally, "Goodbye" to Chai Guy, the co-host of BURNcast, as he takes the summer off to hike the Pacific Crest Trail. Recorded at Xara Dulzura, April 29 - April 30, 2006. If you’re playing the 3Playa Community Drinking Game at home, this episode ranks low-to-medium (depending on your level of sobriety) for community celebration and inebriation. Watch highly entertaining and groundbreaking fire choreography from Xara Dulzura of the Phoenix Projekt’s cover of “Ooops, I Did It Again” featuring Tubatron. Fred Murphy talks about Burning Flipside, the largest Burning Man regional event that takes place in Texas over Memorial Day weekend. Fred is the regional outreach coordinator for Flipside. 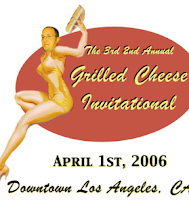 From downtown Los Angeles, BURNcast brings you the 3rd 2nd Annual Grilled Cheese Invitational brought to you by the Intolerable Morons of Smashlabs™ and Theorylabs™. Recorded April 1, 2006. 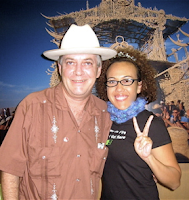 Our conversation continues with Larry Harvey, Danger Ranger and Maid Marian. Here we ask: "Is Burning Man still dangerous?" Also discussed is hope and fear: the future of Burning Man. We wrap it all up with a special bonus track of Larry's explanation of why coffee is sold at Center Camp. Recorded on January 31, 2006 in San Francisco, CA.